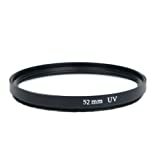 The MC 52 mm UV Filter is a filter absorbs UV rays and without impact on the visible light, which will significantly improve the performance of your camera lens. Its use is recommended when the weather is fine in order to reduce the air layer on the horizon as well as the dominant blue which can appear with the sea photos or pictures of the mountain. This filter is especially useful in black and white. Can be used time and time again as protective filter to protect your lens from scratches, water, dust and dirt. This UV MC Filter has a multi-layer coating. The treatment on a a filter designed to improve the transmission of light, protect the internal filter and eliminate the effects Ghost and thoughts. This entry was posted in Discount Photography and tagged 52mm, Diameter, Filter, lens, MultiLayered, Treated by Ball Photo. Bookmark the permalink.